How to Setup Employer D Exportation? A) Where to set up my exportation? Go to « Settings » (see pink arrow). 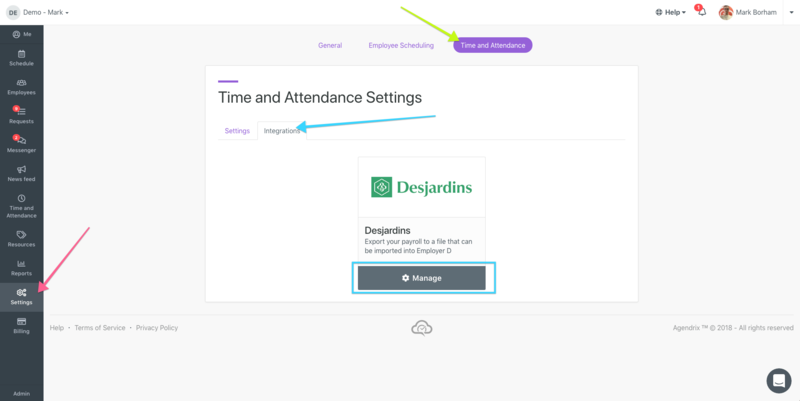 Proceed to the « Time and Attendance » tab (see green arrow). Click on the « Integrations » tab (see blue arrow). Click on the grey button « Manage » that corresponds to Employer D.
First, log in to Employer D.
Company number will appear in the middle of the home page. 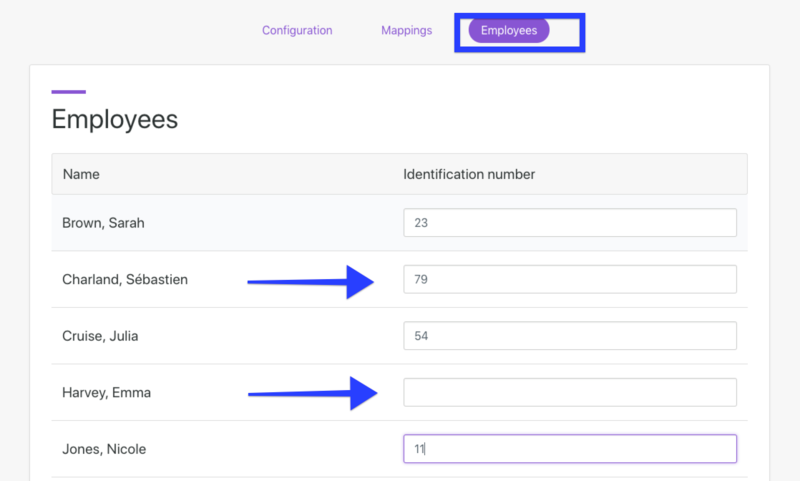 If you have more than one location, you might have more than one company number. 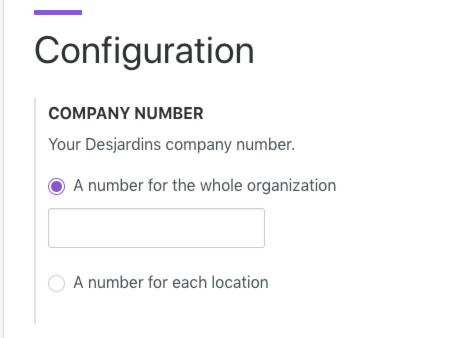 If so, select « One number for each location » then enter the numbers. Do NOT include letters in the company numbers. For example, PM123456 must be written 123456. C) How to get the complete list of earning codes in Employer D? Click on « Company Settings ». Click on « Earnings and Deductions ». Regular: Enter the earning code used for regular hours in your payroll system. Most of the time, this is earning code « 1 ». Overtime: Enter the earning code used for overtime hours in your payroll system. Most of the time, this is earning code « 43 ». Earning codes for payroll systems vary significantly from one company to the other. It is possible that Agendrix does not support certain earning codes. Click on the « HR » tab. Click on « Selection of employees (HR) ». The « Employee no. » column shows what is called « Identification Numbers » in Agendrix. Make sure that no two Identifications Numbers are identical for two different employees, and that no employee has two different ID numbers. For each employee, enter the Employee no. used by your payroll system (see pink box). If an employee ID Number is left empty, no information will be exported. Once completed, you will be able to export your timesheet in Employer D format. Here is an article that explains How to Export My Pay Into Employer D?